"Get Trained by 13+ Years Expert Professional - Watch Live Class Sessions Videos on YouTube"
eMarket Education imparts best Digital Marketing Course in Bangalore in 2.5 months while inculcating a training practice (i.e., Live Project management with real-time implementation & 1-1 attention guidance), which guarantees Students to learn strategies & develop a digital marketing process to achieve 100% target deliverable for any SEO, PPC Google AdWords or Social Media activity. We at eMarket Education, Digital Marketing Training Institute in Bangalore ensure extensive hands-on Digital Marketing training with Live Projects, Practical Assignments, Case Studies, Google Certified, Backup/ Revision classes, Job Resume Preparation post completion of digital marketing courses, Interview guidance & dedicated effort from management and faculties for 100% completion of course successfully & Job Placement. Only selective students choose eMarket Education as their Digital Marketing Institute and vice versa. There is so much to learn in Digital Marketing subject for a beginner. You need 6 months to a Year to learn all, in the best possiblities of practical implementation while having the confidence to prove target numbers. The most important modules will be start with Blogging Intro followed up with SEO, PPC Google Ads, SMM & Email Marketing, which every company having an online business should implement. Not every company does affiliate marketing or video marketing, or influence marketing or other activities. So the best way wouldbe to learn this 4 moduels in a given way that you’re able to accomplish results with less guidance with strong practical knowledge and latest trend updates. Your biggest confusion would be around modules covered, trainer’s profile, right duration, course fee and job placements. As a beginner, you can’t learn everything in 2/3/4 months, so the best to learn will be those modules that every companies uses to scale their businesses online. Next, check the trainer’s profile, live class videos or demo sessions on any subject topic from the respective facuties to judge, whether paying whatever the amount is worth or not? The course duration depends on the faculties experience and the amount of assignments being completed to still have a wonderful training in right time period. Course fees is a big confusion nowadays, since you can find the course starting from 7K to lacs of amount; the best way to decide the right institute and go ahead with paying the fees would be to check the trainer’s class videos and speech delivery with success rate. For us, if the best of course delivery with assignments completion and quality live project guidance to implement and show up target numbers, then I’m pretty confident the job success would be yours. Our Digital Marketing Institute prepares for a career that guarantees “Becoming 100% Confident in Delivering Results on any Live Project, Passing Google Certification exam, Commitment for Internship & 100% Job Placements.” The best way to believe our training quality & efforts, and also the faculties clarity of delivering speech on the subject knowledge and delivery part is to check the Live Class Sessions training videos of Ranjan Jena on YouTube. "Best Digital Marketing Institute in Bangalore. You will get both practical & theory knowledge. One on one teaching and discussions with a max of 6 students. Thanks to all the faculty members of Emarket education for teaching me in the best way possible and to provide live projects which boosted my confidence. " "Best Institute to learn Digital Marketing and get inspire, the teaching staff is very supportive and friendly. Made us to work on live project for SEO and PPC courses which was quite helpful. 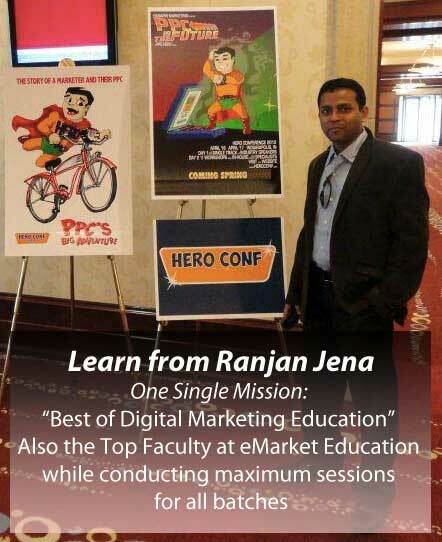 Ranjan Sir has been very helpful throughout the course. Fee can be paid in installments and the wonderful thing is placement is guaranteed." "The course was very well presented. Points were explained extremely well backed up by good knowledge. Had great opportunities to improve my skills. I enjoyed each and every class. It was not one way communication." Looking for Course in Digital Marketing?